One of the most spectacular beasts from Amerindian mythology must surely be a huge, terrifying creature known as the thunder horse. According to Sioux legends emanating from Nebraska and South Dakota, thunder is the sound produced by the impact of its hooves when it leaps down from the skies to the ground during violent storms, and while on Earth it also uses its hooves to slay bison. Needless to say, it would be tempting to postulate that this extraordinary story was inspired by eyewitness accounts of some mysterious living creature – accounts perhaps passed down verbally from one generation to another for many centuries and subjected to much elaboration and exaggeration, but nonetheless derived ultimately from original encounters with a modern-day animal. In fact, the true solution is very different. The thunder horse legend actually arose from occasional discoveries by the Sioux Nation of huge fossilised bones – which usually came to light by being washed up out of the ground during heavy rainstorms. Unable to explain their origin, but aware of their appearances’ coincidence with rain, the Sioux assumed that they were the earthbound remains of some immense, storm-engendered sky beast – and thus was the legend born. 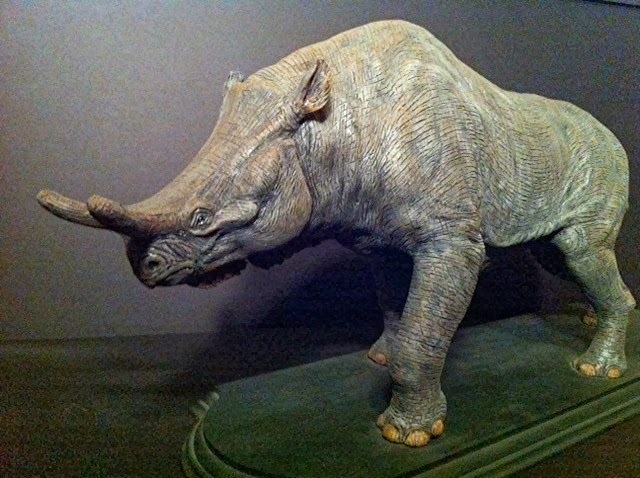 In reality, the bones were from an enormous rhinoceros-like ungulate, standing 8 ft tall at the shoulder and belonging to an extinct family of horse-related perissodactyls aptly called titanotheres. The type responsible for the thunder horse legend had existed roughly 35 million years ago, during the late Eocene epoch, and it had borne upon its nasal bones a massive V-shaped projection most closely resembling the horn-like structures (ossicones) of the giraffes. 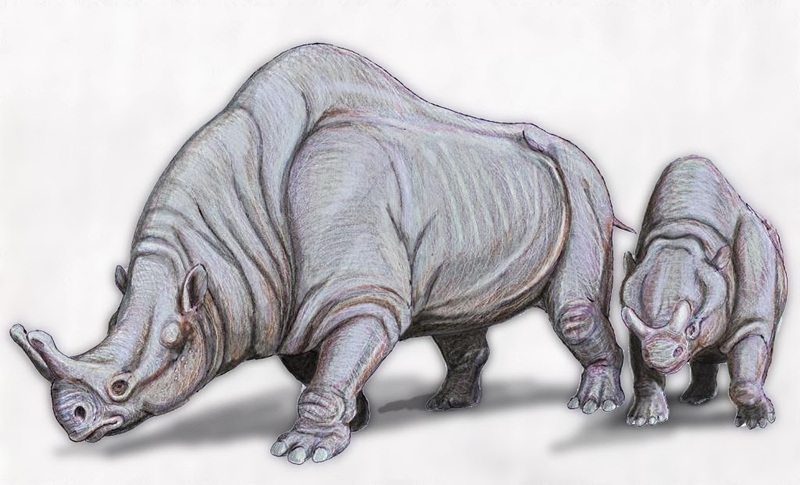 When this creature’s remains were examined during the 1870s by the celebrated American palaeontologist Prof. Othniel Charles Marsh, its intimately-associated thunder horse myth inspired him to christen it Brontotherium – ‘thunder beast’. 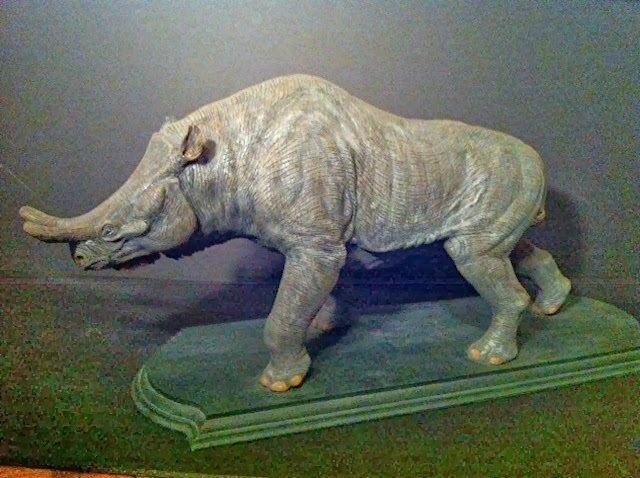 NB – In recent years, the genus Brontotherium (along with several other brontothere genera of titanothere) has been synonymised with Megacerops by some researchers, but as far as its legendary past is concerned, this spectacular beast will always be the thunder horse – a monumental physical embodiment of the thunderstorm’s awesome power and terror. To read online a poem of mine, ‘Behold The Thunder Horse’, inspired by the Sioux Nation’s thunder horse legend and contained in my self-penned poetry book Star Steeds and Other Dreams (2009), click here. 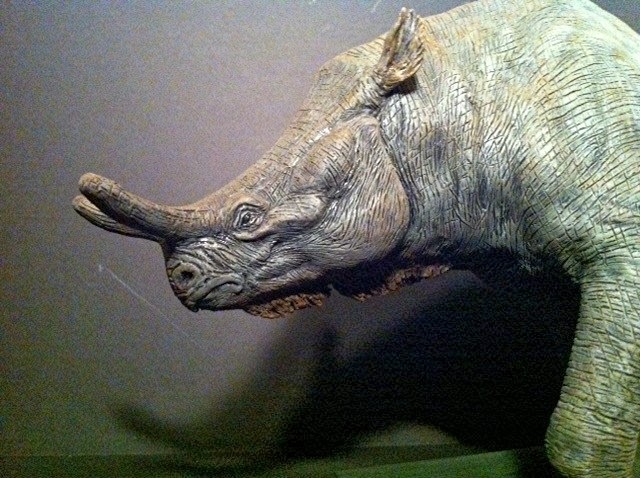 This ShukerNature post is excerpted and updated from my book In Search of Prehistoric Survivors (1995), which is to be re-issued in the not-too-distant future due to popular demand, so be sure to keep a lookout for it!